Fashion Plate: Leave the Gun. Take the Cannoli. I took the most ridiculous pictures yesterday. I don't even want to download them from my Nikon because they define WTH. I'd love to be all "arty-farty," but I'm more "holy-hell-what-is-that?" I am an elegant doofus. Yup. I should get me a t-shirt and make it official. But the day was good! We had a very small group this year. Just Lorenzo and BT. Pup's wayward brother was coming, but chickened out at in the end. I felt bad because he either spent the day alone or in a bar. Either one is not good. I made the smallest turkey I ever made. I think it was only 12 pounds. It looked like a big chicken. So, of course, I overcooked it a bit. But that's what gravy is for! I made a roaster pan inches thick with that stuff. Oooooo, it was good. My momma taught me how to make gravy when I was pretty small. I think 10 or 11. I honed that talent while pregnant with Lorenzo. I had a pregnancy related craving for everything smothered in gravy so we ate it every night if memory serves. I learned new things this Thanksgiving. It's a big meal to make, even with a small group. Riesling wine isn't always good. Paaaatooy I say. Having a huge weight lifted from me is fantastic! I feel like me again. Cranberries from the can are delicious spread on a piece of turkey like jelly (smooch to my Shelley-Belly). New and easier recipes are good (again, thanks to my Shelley-Belly). Lorenzo and BT spent the first part of the day at his 'rentals (the Lorenzo way to say parents) and had a noon meal then came to our house for the evening meal. BT and Pup rolled into the Big Room to wait for Lorenzo and me to clear up in the kitchen a bit (we did not do dishes - yes they are still in the kitchen, right now, haunting me). The Godfather was marathoning on AMC (I think) so we dragged out our copy after hearing that Lorenzo had never seen The Godfather. WTH??? How did I raise a child that has never seen The Godfather? So we pulled the pit (couch) into a big square and the four of us lay in it to watch. Appropriate since Lorenzo and I were drinking Coppola wine. Nummy. I think I was snoring before you could say "she sleeps with the fishes." 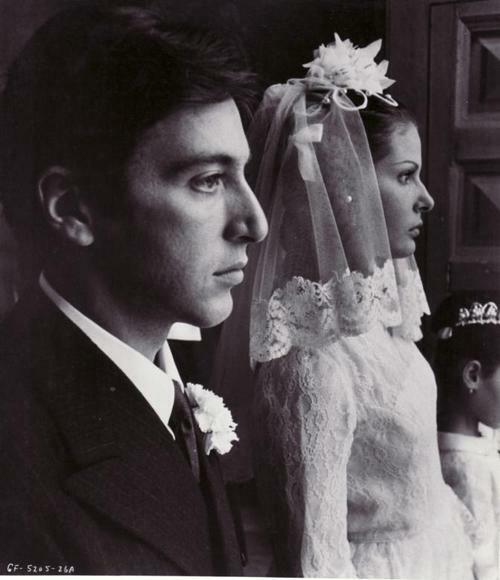 BTW - how beautiful was Al Pacino in this movie? You can laugh if you want, but I don't think I've ever seen it, at least not the entire movie. Cozy and yummy and entertaining and memorable...all those things. Makes me wanna go watch a good classic and settle down for a chillaxin evening. I've never seen The Godfather. Not even a little bit. Pacino is certainly awesome in the Godfather - he's like a foil to Brando, attractive, young and utterly cold and ruthless. Glad you survived Thanksgiving. I think there has to be an award for the smallest roast bird possible, sparrow maybe. Oh yes, this year I definitely discovered that it's a BIG meal to make, even for a small group!